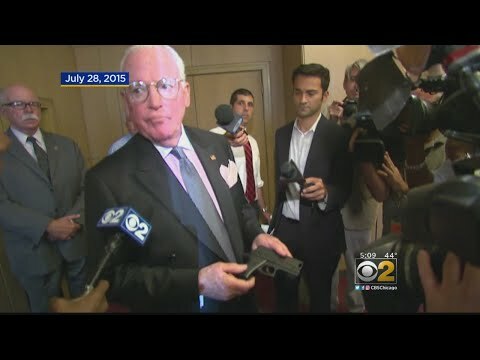 Chicago gun control advocate Edward Burke (who has been in power for over 50 years) has stepped down as Alderman in Chicago. Federal prosecutors unsealed an indictment charging him with extortion after his offices were raided in November. Burke has been a voice for Chicago gun control for years. But when the Feds raided his office, they found 23 guns. The court ordered him to surrender all 23 guns. Will he surrender them? Oh, and his office was a gun-free zone. Over the years Burke reamed the NRA, demanding to know if they would stand for “common sense” gun laws. You know, like the kind that didn’t apply to him. He was instrumental in banning lots of things in Chicago, but guns was one of his pet pursuits. In 1982, he proposed a ban on handguns. It became a “model” across the nation for the Democrats who thought restricting law abiding citizens was a smart move. He has been pushing gun restrictions through Chicago for years. Chicago is a pretty violent city, but its political leaders don’t need 23 guns to do their jobs. Unless their job is extorting businesses. That’s why the Finance Committee chair and occasional PI has been charged with one count of attempted extortion for trying to shake down fast food restaurants. Here’s how the alleged scam worked. In addition to being one of Chicago’s top bosses and a private investigator, Burke also had a law firm. And the Chairman of the Finance Committee’s law firm specialized in, what else, property tax appeals. A humble hack would have been satisfied with that degree of corruption, but Ed Burke was not as ordinary politicians are. Humble men don’t try to ban all the guns in Chicago while having enough guns in their office to outfit a small gang. And even in his seventies, Burke wasn’t just going to wait for suckers to come to his law firm on their own and get some help with their property tax issues. Burke has been charged with threatening to block driveway permits for fast food restaurants unless they gave his law firm a taste. That was apart from trying to fine fast food places $1,000 a day for cooking with trans fats. You can see why he needed weapons on the job. The Chicago Dem is also accused of soliciting a campaign contribution for another politician. Burke’s law firm, Klafter and Burke, also sought property tax relief for numerous clients. After he was charged, the developers at Sterling Bay, who have used his firm in the past to seek tax relief, dumped him. Once again, a corrupt politician wanted to restrict the rights of everyone except himself. His “reign” may be ending, but there are plenty of successors. It’s the Chicago way.